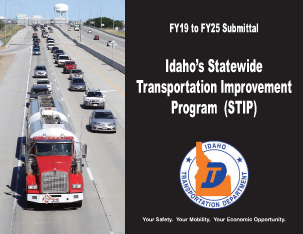 Here you’ll find information about funding, contacts for getting involved in transportation decision-making processes and transportation projects in planning, design, and construction phases throughout Idaho. Public involvement is the keystone to building and maintaining a successful transportation system. To achieve that success means spending as much time listening and learning as teaching and telling. The Idaho Transportation Department is committed to creating for all Idahoans, a transportation system that meets the needs of the 21st century. • ITIP – STIP – TIP: What’s the difference? Every hour of every day – the work of the Idaho Transportation Department touches the lives of each citizen. Idaho’s transportation system is critical to the economy. It is the lifeline that allows products to get to market, goods to be delivered to stores, and employees to get to work. Additionally, it connects people, education, health care, places of worship, cultural and sporting events, recreational opportunities, and family members. Our transportation system generates economic opportunities and supports our quality of life. It ensures our security at home and abroad. That’s why it is critical for the department to listen to and work with our partners – citizens, business leaders and elected officials – to meet and exceed their expectations. The department holds public meetings on projects and provides information on its web and social media sites. Please let us know how we’re doing by attending our meetings or offering input by phone, e-mail or through social media. Highways, aviation, rail and public transportation needs are all taken into consideration when planning Idaho’s transportation future. Traffic patterns and congestion, land-use issues, safety and preservation of freight rail lines are all important. The transportation department’s planning specialists work closely with local governments, regional planning organizations, the state’s leadership and the public to respond to these needs. Public comment is an especially critical step in reaching decisions. The transportation department actively seeks the public’s advice throughout the planning, designing, construction and operation of a project. Reaching rural and metropolitan communities through numerous corridor studies, which include: Interstate 84 Corridor Study; Interstate 84 – Orchard to Gowen Planning Improvements Study (completed); U.S. 20 Corridor Study (completed); U.S. 26; U.S. 91; U.S. 30; U.S. 75; Snake River Crossing Study (completed) and U.S. 95. Distributing information about the WYE Interchange Reconstruction Project at local malls and other areas with heavy traffic, such as Edward’s Cinemas. Weekly public meetings for major construction projects such as the WYE and Franklin Interchange projects. Setting up informational booths at public events, such as the Eastern Idaho Fair in Blackfoot, the Twin Falls County Fair in Filer and a transportation fair in Pocatello. Providing an easy-to-use Statewide Transportation Improvement Program booklet for review and public comment. Meeting with Native American tribal governments, civic groups and clubs. Attending annual meetings for the associations of cities, counties and highway districts. Participating with local planning agencies in their public involvement efforts. 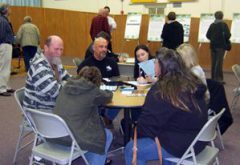 Include public comment from mail, e-mail, and internet interaction for people who can’t attend Statewide Transportation Improvement Program (STIP) public meetings. Bringing public information and comment opportunities to the Internet. These sites provide 24-hour access to project information for citizens who can’t make it to public meetings, as well as allowing them a forum for questions and comments. The Transportation Board appoints the transportation department’s director and delegates certain powers. The director in turn delegates authority and responsibility for performing work to transportation department managers. 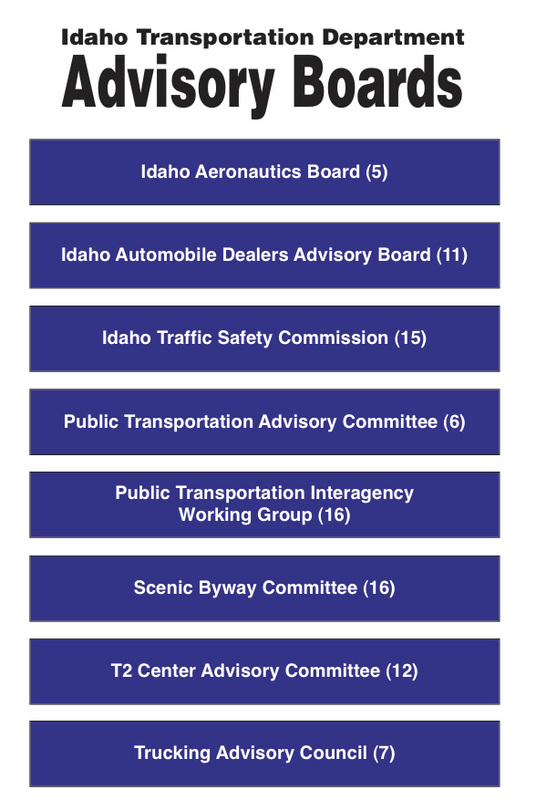 Policies are recommended to the Idaho Transportation Board by transportation department staff and eight advisory boards and committees. In 2006, the Idaho State Legislature approved the use of Grant Anticipation Revenue Vehicle (GARVEE) bonds to fund high-priority transportation projects throughout the state. This historic legislation resulted in an unprecedented number of highway improvement projects in Idaho between 2006 and 2015. In response to ongoing transportation funding needs, the Idaho Legislature in 2017 approved an additional $300 million in GARVEE bonds. The bonds could be spent on 12 of the original corridors from the 2006 bill. The original GARVEE bill identified 13 high-priority corridors throughout the state, but through an evaluation and prioritization processes only six of the corridors were advanced. Through the GARVEE program, 35 new bridges, 14 new or improved interchanges, and 119 miles of highway expansion were completed on these six corridors. GARVEE bonds in the amount of $857 million were used to fund these projects. NEPA is the National Environmental Policy Act of 1969. It is primarily a procedural statute (40 CFR sec 1500) for decision-making during federal actions. The statute assures that proper technical, economic, and environmental analysis are performed. For additional information go to the Environmental section of this website. What Does NEPA Require of Agencies? Documents the environmental analysis process in plain language for the decision-maker and the public. What are the three types of NEPA documents? The following manual provides the funding information and instructions necessary for the annual update. In order to make wise decisions that truly represent the needs of Idahoans, the transportation department relies heavily on the expertise of advisory boards and professional organizations. 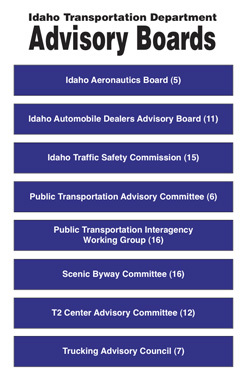 The following groups meet regularly and make recommendations to ITD staff and the Idaho Transportation Board. The five-member Aeronautics Advisory Board advises the transportation department staff and the Idaho Transportation Board on aviation issues. Members of the Aeronautics Advisory Board are appointed by the governor and confirmed by the Idaho Senate to serve staggered three-year terms. The members represent one of five geographic regions of the state. No more than two members may be of the same political party. The Idaho Automobile Dealers Advisory Board advises the transportation department in administering and enforcing the Motor Vehicle Dealer and Salesman Licensing Act. The governor appoints seven members for three-year terms. The Idaho Traffic Safety Commission reviews traffic safety issues, promotes local and state cooperation, recommends programs for federal aid and supports accident prevention. The commission consists of 15 members including the chairs of the Idaho Senate Transportation Committee and the House Transportation and Defense Committee. The Public Transportation Advisory Council advises the Idaho Transportation Board on public transportation issues. It is comprised of six members appointed by the Idaho Transportation Board. Members are appointed for staggered, three-year terms. See the Public Transportation web page for more information. The Public Transportation Interagency Working Group assists the transportation department in analyzing public transportation needs, identifies areas for coordination and develops strategies for eliminating procedural and regulatory barriers. This 15-member committee advises the transportation board about scenic byway issues, including scenic byway eligibility, establishment and support. Members represent federal, state and tourism interest. There is no fixed term for members or restrictions on the number of members. The committee meets four times annually in Boise. With the completion of the highway needs study and the dissolution of the Local Highway Needs Assessment Council (LHNAC), the Technology Transfer Center Advisory Committee was created. The members will help guide and direct the policies and activities of the Idaho Technology Transfer Center. The seven-member council recommends highway improvements and advises the board on laws and rules that affect Idaho trucking operations and safety issues. Metropolitan Planning Organization, commonly referred to as an MPO, is an association of local agencies that coordinate transportation planning and development activities within a metropolitan area. Establishment of an MPO is required by law in urban areas with populations of more than 50,000 in order for the area to use federal transportation funding. MPOs are designed to ensure coordination and cooperation among the various jurisdictions that oversee transportation within the urban area. A technical advisory group of professional planners and engineers who are often employees of the same agencies. An MPO is not a level of government; however, the MPO has effective control over transportation improvements within the area since a project must be a part of the MPO’s adopted long-range plan and be placed in their Metropolitan Transportation Improvement Program (MTIP) in order to receive federal funding. ITD no longer provides the “Search for Road Reports” application. Please refer to the Summary reports below for details provided on the reports or contact the ITD Financial Planning and Analysis Section for assistance.